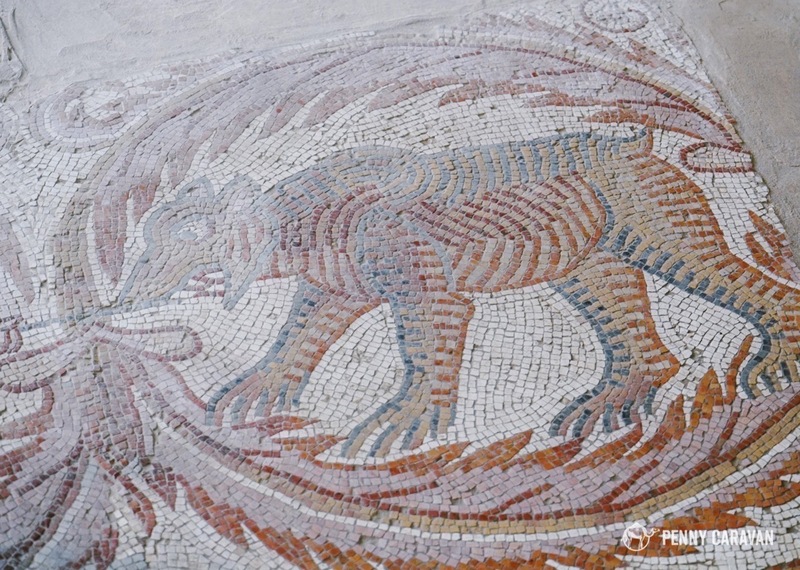 Imagine digging a foundation for your home and coming across ancient mosaics that had lain undisturbed for more than 1,000 years. 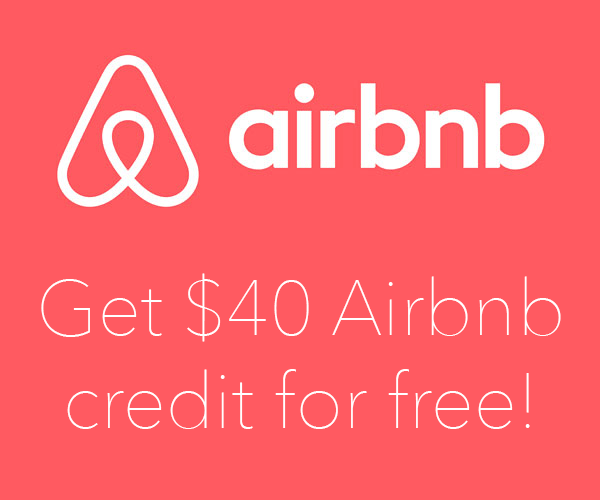 When 90 families moved to Madaba, Jordan in 1880, this is exactly what happened. As part of a Christian minority, these families were relocated to escape the oppressive circumstances of their village in southern Jordan. Imagine their delight in finding fragments of a Christian society making up the very foundation on which they were to establish their new home. All over town as they sifted through ancient rubble for building materials, they found remnants of Byzantine-era homes and Church buildings, all housing beautiful mosaics. 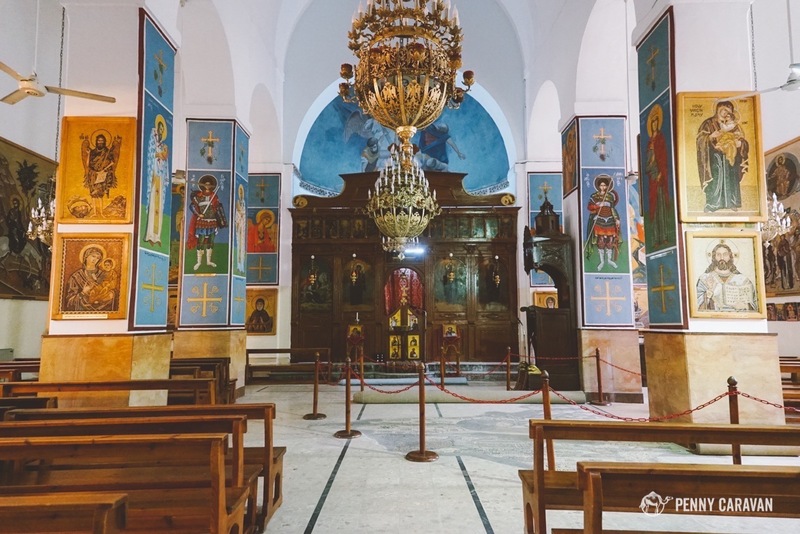 Madaba boasts 4,500 years of history, beginning as an Ammonite village mentioned twice in the Bible, and flourishing during the Christian Byzantine period when it saw the building of these churches and mosaics. 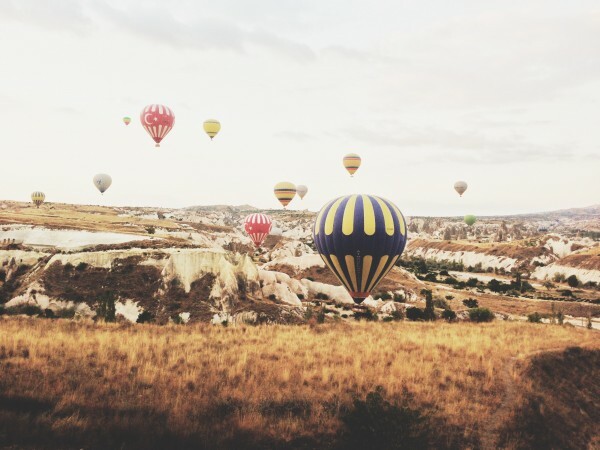 It was an earthquake that turned it into a ghost town circa 800 AD, an event that would leave it undisturbed until those families came along a thousand years later. 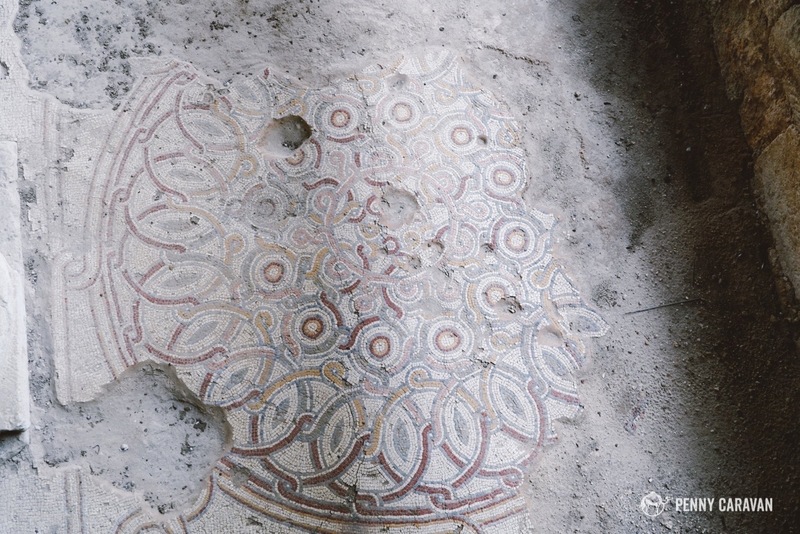 The discovery of the mosaics has made up the very identity of this little town. 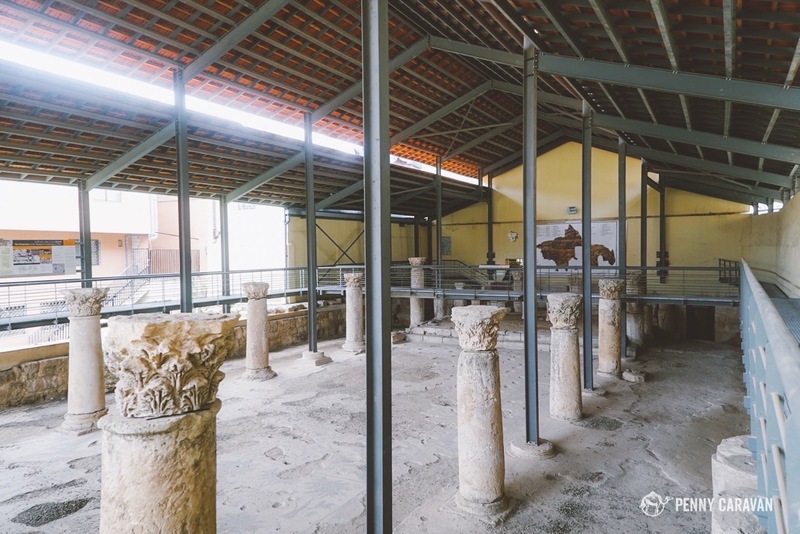 The extent of the historical sights located all over means excavations and restoration are still ongoing today! 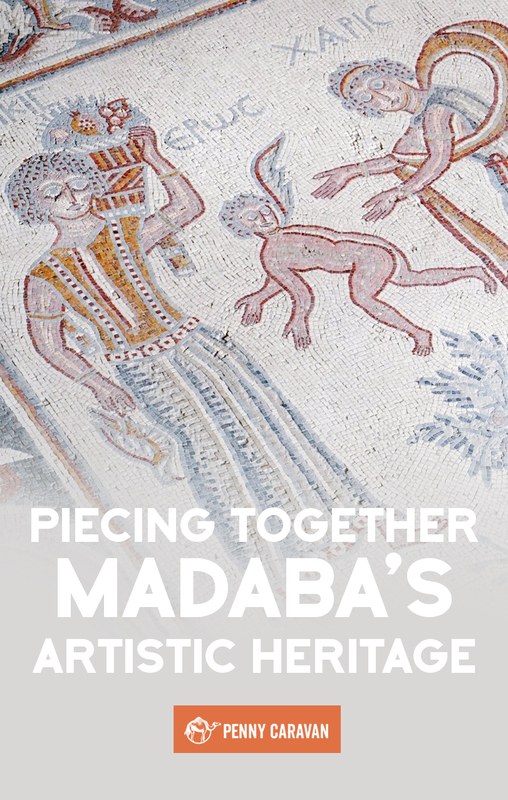 A school has been established dedicated to the production and restoration of mosaics—a beautiful tribute to Madaba’s artistic heritage and a valuable resource for the families who have made their home there. We were only able to make it to a few of the many highlights of this unique town, beginning with the famous mosaic map. 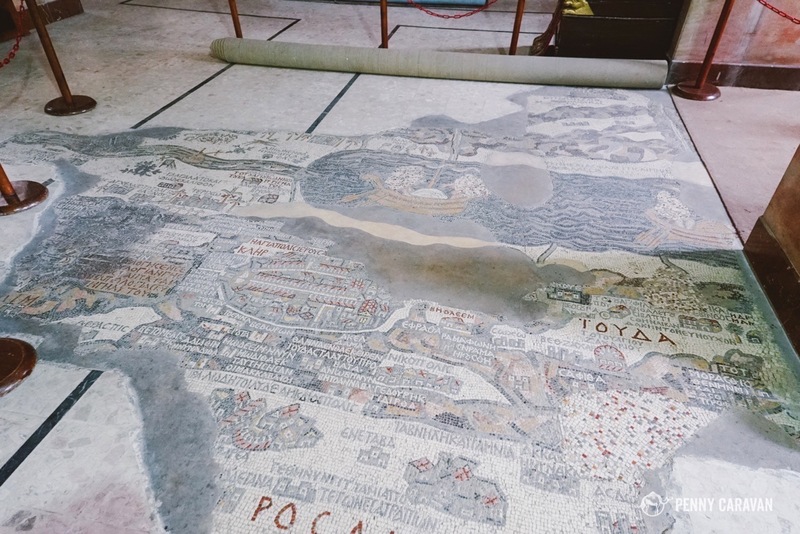 Madaba’s paramount archaeological find was a mosaic map of Palestine, containing the the oldest known map of Jerusalem in existence. The map is oriented to the east, so you have to look at it imagining you’re west of Jerusalem, looking toward Jordan. The map was crafted in 560 AD with over 150 captions and was instrumental in helping scholars define the 6th century layout of Jerusalem. St. George’s Church, where the Madaba map is located. 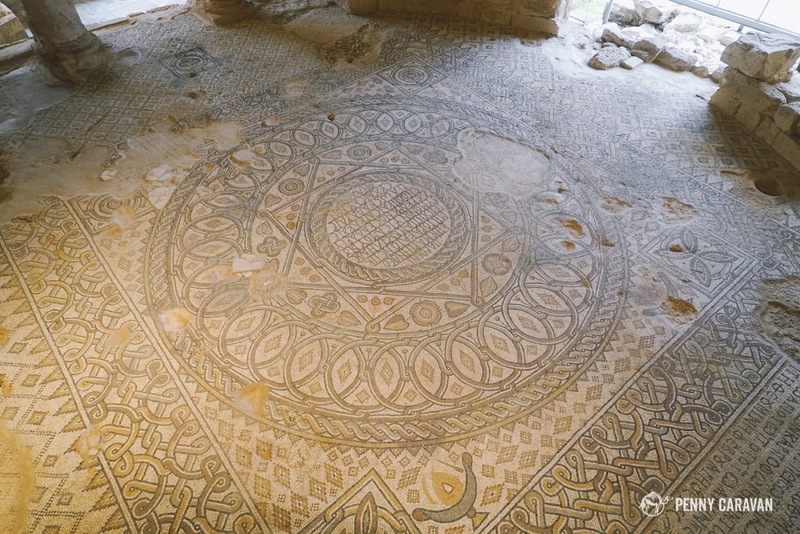 The mosaic map on the floor of the church faces East. 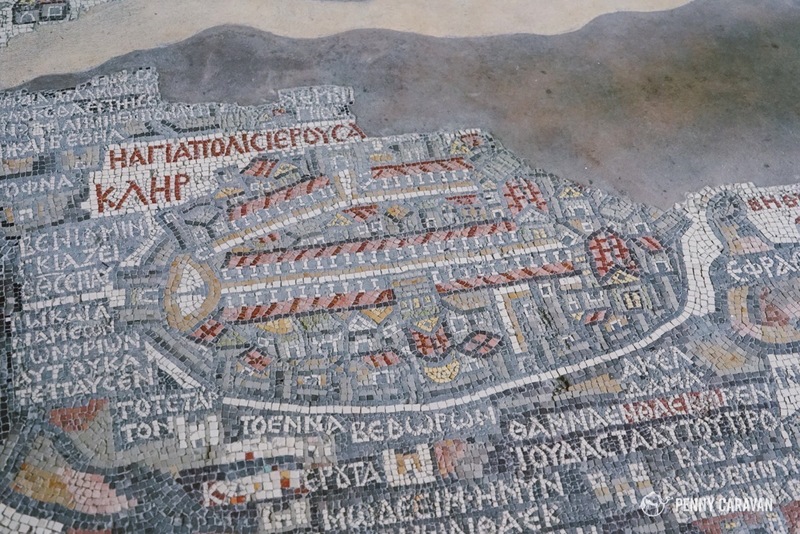 Jerusalem represented on the mosaic map. 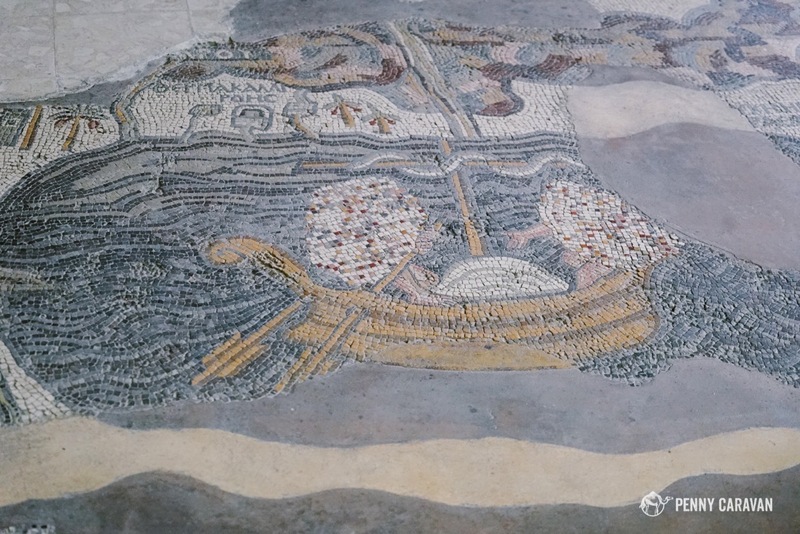 The Dead Sea represented on the mosaic map. Some beautiful modern mosaics in the church. 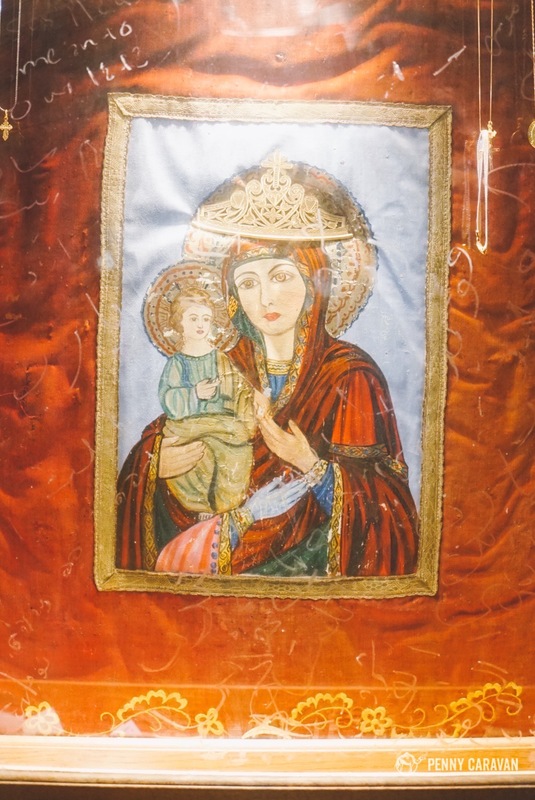 A beautiful icon in the grotto of the church. 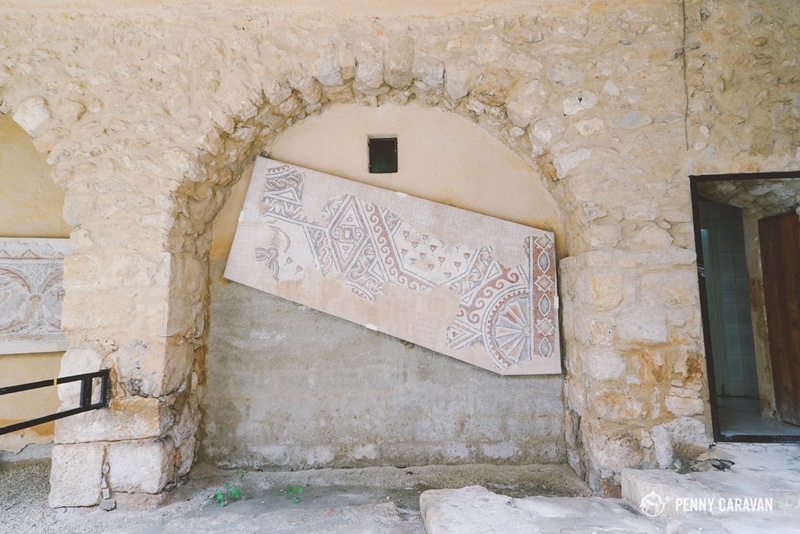 There are two sections of town where mosaics have been preserved and collected into open air museums. The first one houses the Virgin Mary Church which dates from 767 AD and centers around an large circular geometric design. The second one is called the Burnt Palace, because it’s located in the ruins of a 6th century villa that was destroyed by fire. 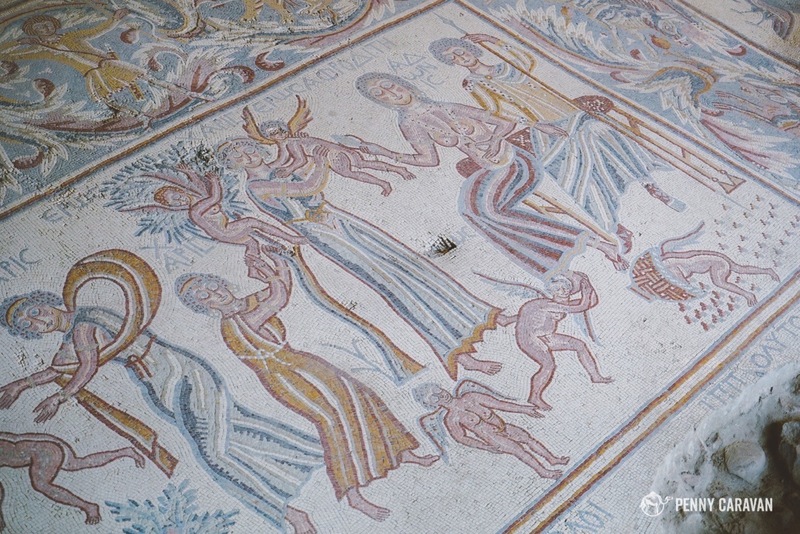 Floor of a 6th century Byzantine villa. 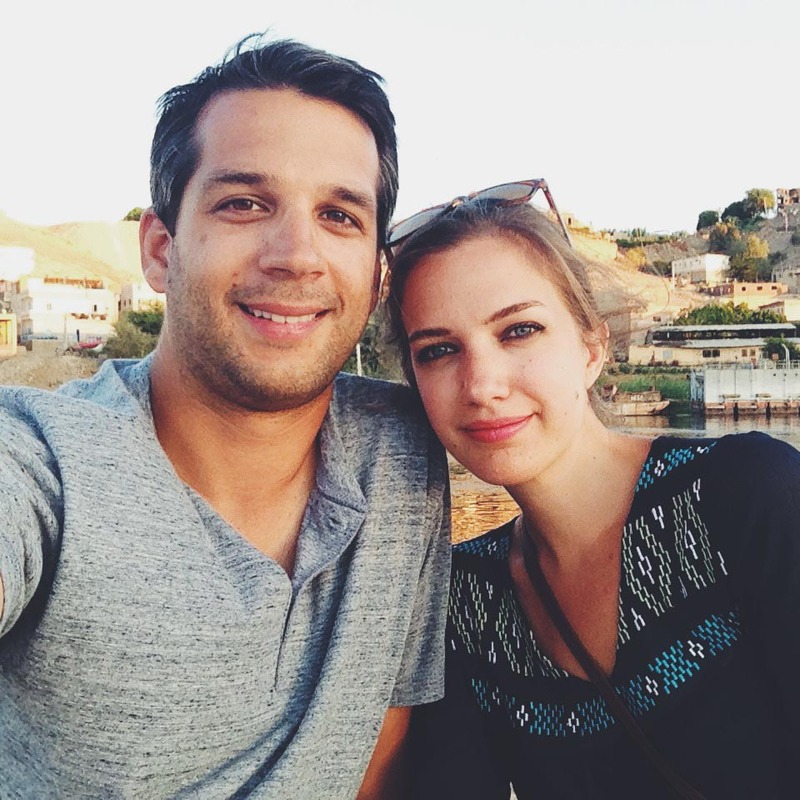 The Greek tragedy of Phaedra and Hippolytus is represented here. 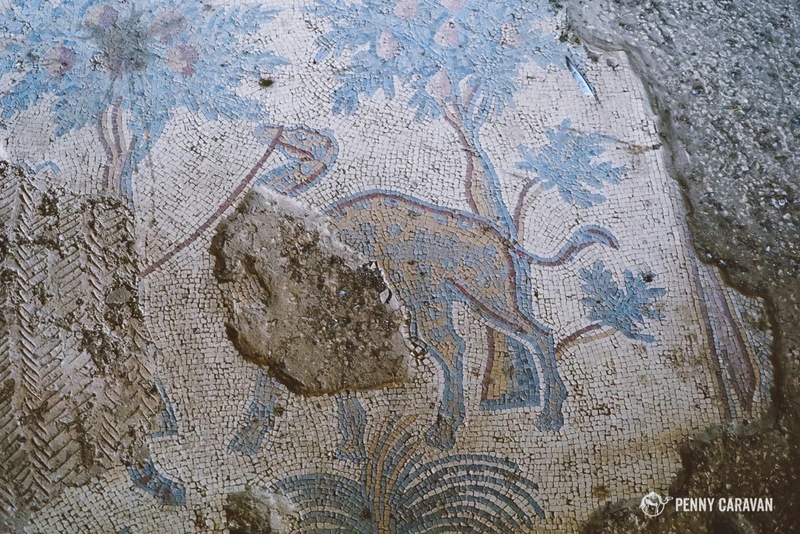 The colors were vivid in many of the mosaics we saw. A camel with giraffe spots. 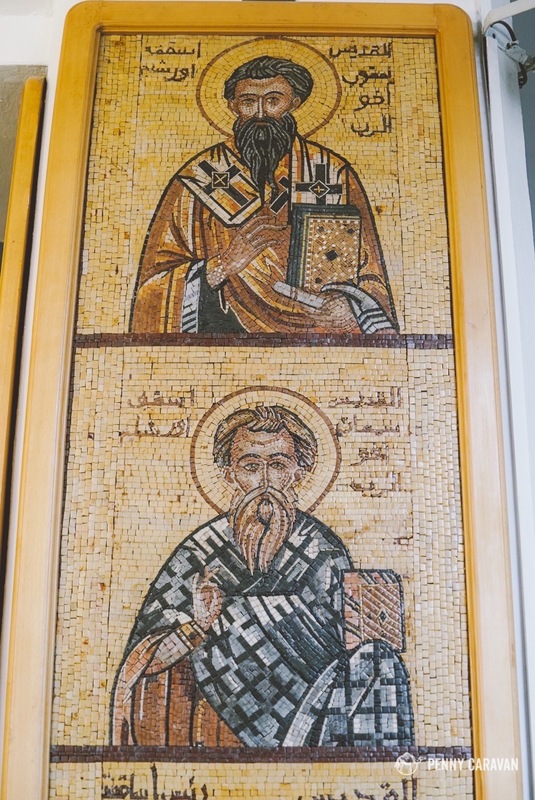 Our visit was on a very cold and rainy day, but in between the sights as we dashed in and out of buildings to keep dry, I got a sense that Madaba would be a very pleasant place to spend a few days! The street between St George’s and the Burnt Palace seems to be teeming with artisan shops selling antiques, hand woven kilims, and (duh) mosaics. 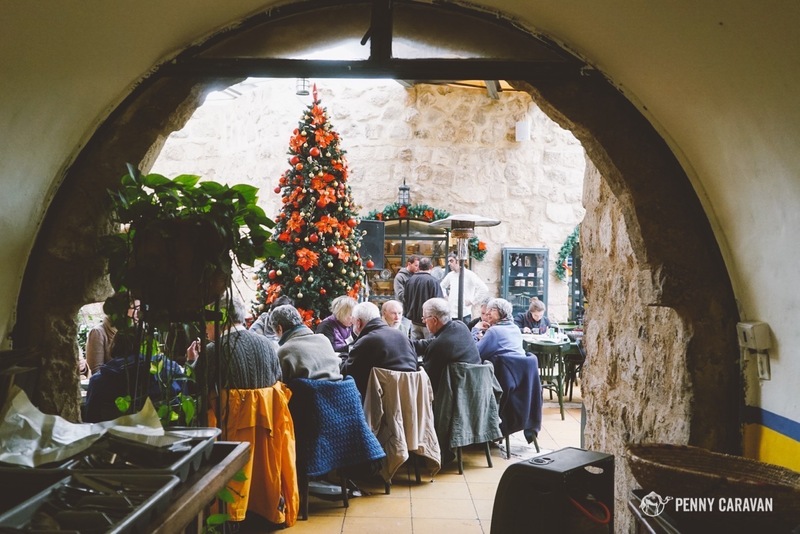 We did manage to have lunch at a charming restaurant in a restored house that seemed to be just as popular with locals as the tour buses. 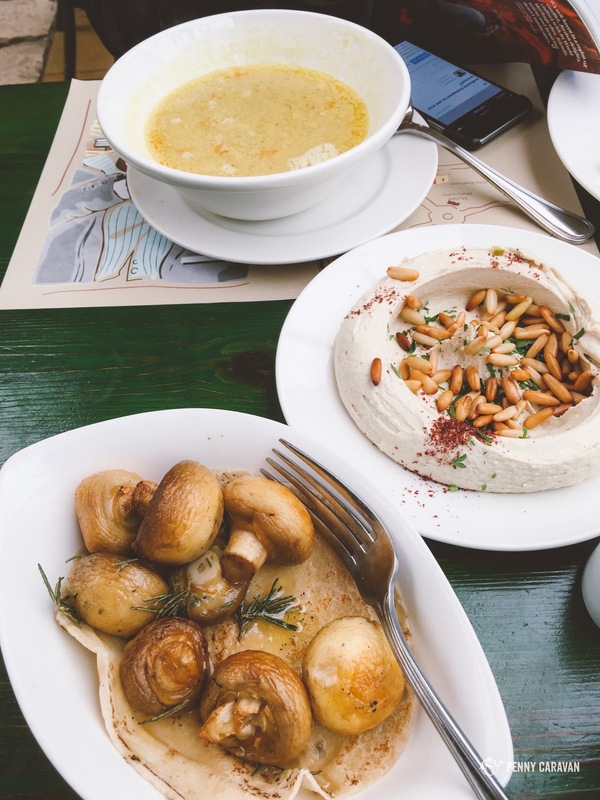 So if you’re looking for a cozy lunch recommendation, definitely check out Haret Jdoudna—the rosemary mushrooms are divine. Lentil soup, hummus and mushrooms. 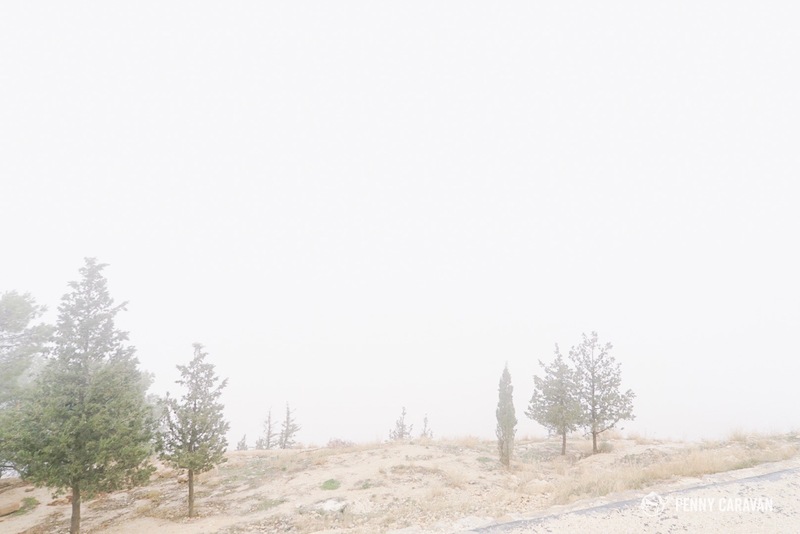 A mere 5 minute drive from Madaba is the mountain where Moses first saw a view of the Promised Land and where he is allegedly buried. 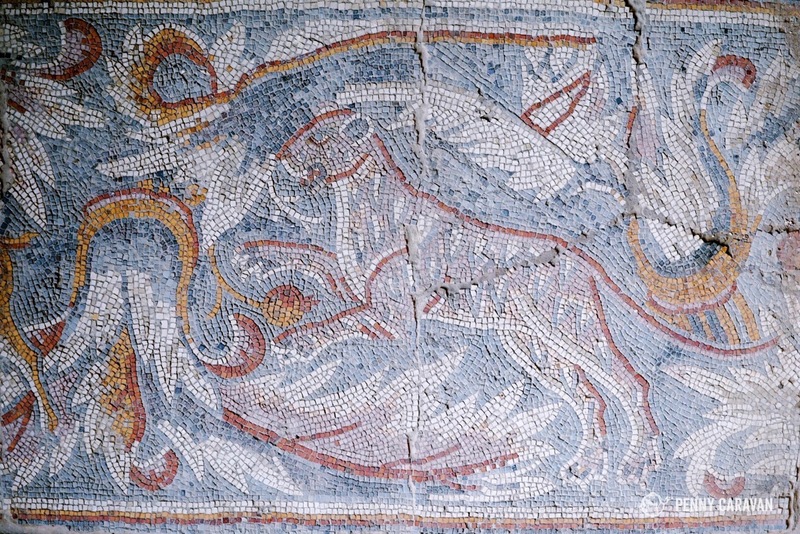 The foundation of the church on the site dates from 393AD, and the church contains some of the best mosaics in Jordan. A foggy day at Mt Nebo. Moses may have gotten a better view of the Promised Land than we did! 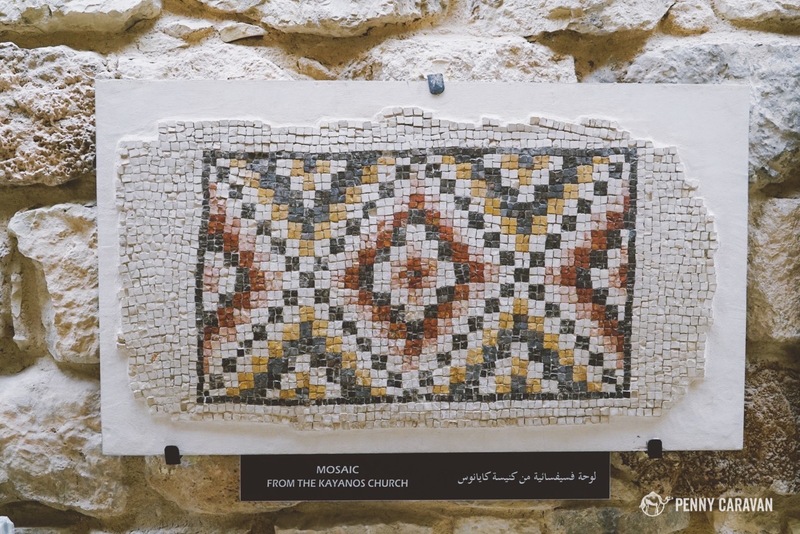 Mosaic museum at Mt Nebo. 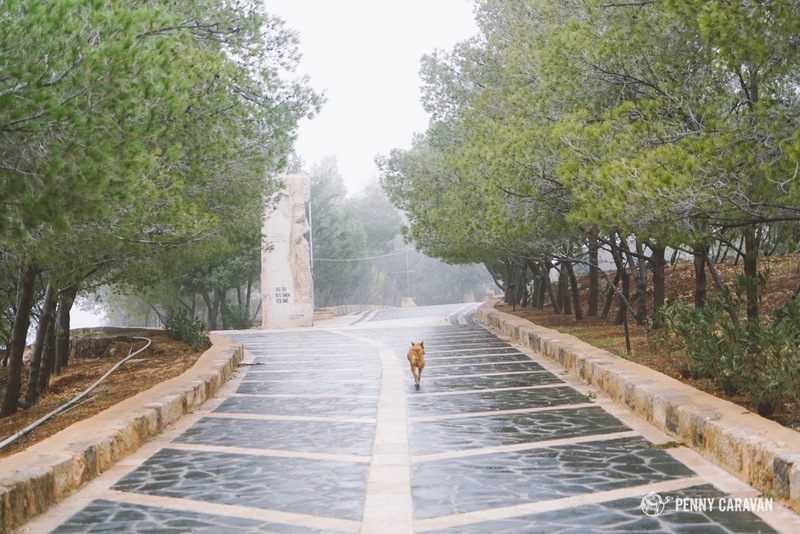 A trip to Madaba and Mount Nebo is an easy day trip from the Dead Sea Resorts of Suweimah or from Amman. A good resource to use for a taxi service is localtrips.net. 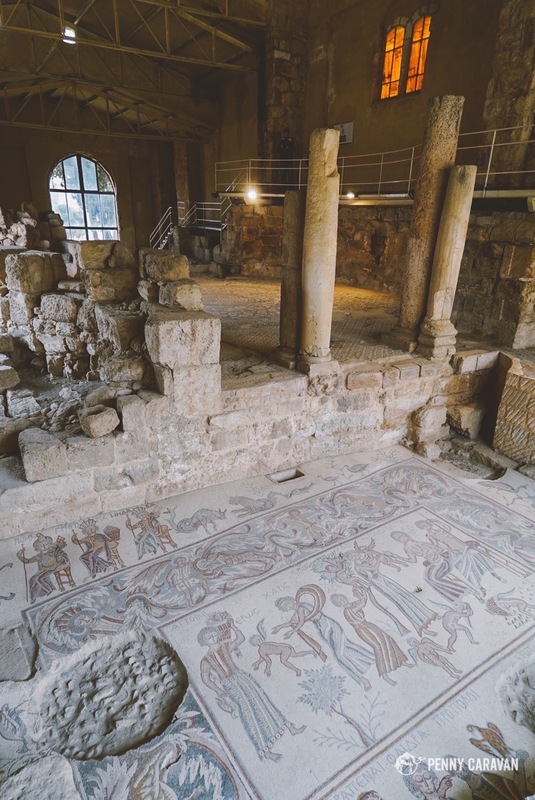 If you’re interested in the historical and artistic culture of the Middle East, then the mosaic map at St. George’s is something you’ll definitely want to see in person (all the extra sites and mosaics just make it worth it all the more)! 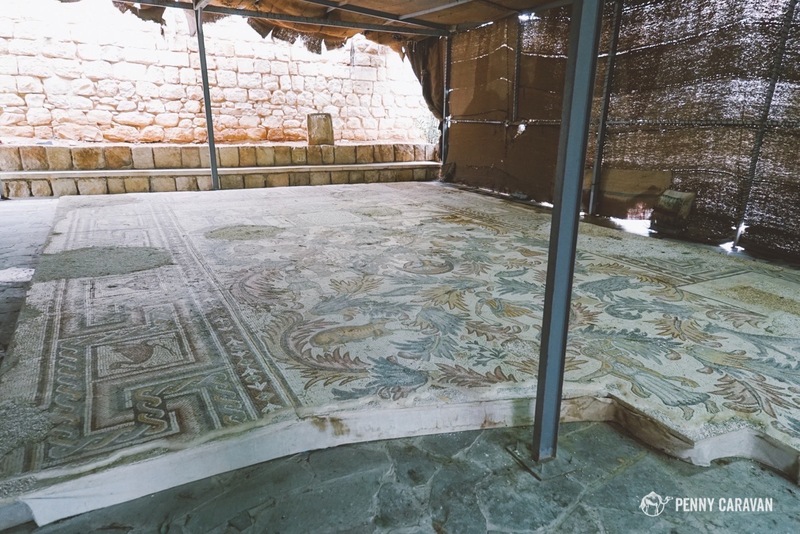 With so many archeological excavations ongoing, there’s sure to be even more treasures worthy of your visit just waiting to come to light in Madaba.